This trims the movie drastically to much more fit to the original movie. This time the T-Rex will not stumble through San Diego. To make Jurassic Park 2 feel a little bit more like the original. - Got rid off all references to the San Diego park and most of the references to hunting the t-rex. This allowed me to get rid off the god awful T-Rex in the city ending, and make the film feel a little more like the first one. I liked The Lost World back in the 90s, but rewatching it nowadays I get more annoyed by the flaws in the story and characters. 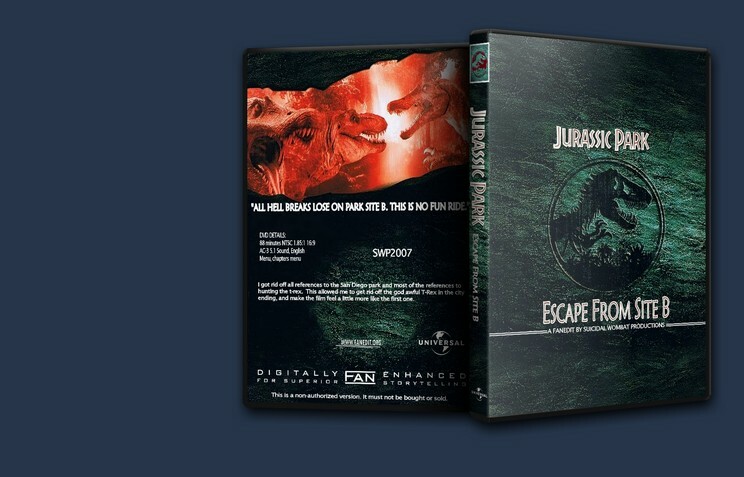 This is an ok re-edit of the movie, excising the San Diego finale well enough but in no way fixed the movie or made it align better with Jurassic Park. A/V quality was sub-par for DVD, but still very much watchable. There was some rough editing here and there as well. In summary, not the most professional edit, didn't fix the film for me, but not a waste of my time. I wanted to give this edit a chance, but after watching the first half I stopped. None of the cuts you made seemed in any way to improve or change the tone of the film, and in fact I think some of them worked against the film. I stopped watching when they let the dinosaurs out of their cages and I realized that you not only cut out the San Diego sequence at the end, but really cut out most of Ingen’s motivation for even being on the island. It’s curious; when I first watched this movie the San Diego T-Rex scene was my favorite part, yet there are two fanedits of this movie on this site that both advertise proudly how they’ve cut that part out. This movie has many flaws, but that scene doesn’t need to be excised entirely; it just needs to be tightened up with some the gags cut out so you can understand how terrifying a T-Rex rampaging through a major metropolitan city really is. Good fanedit overall except the last ending cut….it ends too abruptly with no musical tie in to the credits. The two musical interludes dont match and it seems like a cut versus being seamless to the credits…..